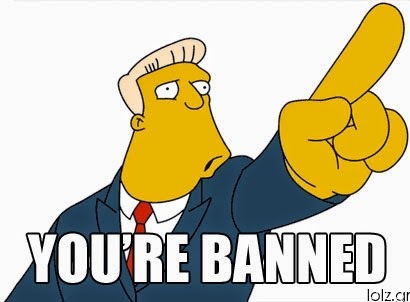 Have you ever been banned off a website? I've been booted off two. I was kicked off Patrick Madrid's Envoy forums after I noted the unstated fact that Madrid had his forum set up to block any hyperlinks to aomin.org. You can read about it here. I was also banned from the Coming Home Network's discussion forums before I even made one post. You can read about that here. Other than these two times, I don't recall ever being banned. Of course, I've been chastised by the Catholic Answers moderators a few times. You can read about it here and here. I've learned at Catholic Answers not to use the alert system when someone insults me. The alert system at C.A. does not work for Protestants. Comments left here on this blog have been helpful and hurtful, kind and rude. I've met some wonderful folks over the years that have stopped by and left a comment. I've also come across some folks that have a difficult time expressing themselves without being offensive or ridiculous. I do enjoy getting comments here on the blog, but I don't live for them. I usually don't post an entry in order to get attention or feedback (I mean, simply look at some of my posts). I post what I post because the blog helps me keep a record of my own theological journey, and it gives me a chance to write about what I like to write about. I've seen many blogs from Christians who say their motives in blogging are "ministry." Well, maybe in some cases it is, but I think most people with blogs have them for selfish reasons. We are all idolaters on some level: the most cherished idol is yourself. I don't think of this blog as "ministry," but from a Reformed perspective, everything we do should be done to the glory of God- whether it's taking out the trash, going to our jobs, or enjoying the hobby of having a blog. If someone searching the Internet benefits from a blog post I put up, that's great, but I wrote it because primarily I enjoyed writing it, not because I was hoping someone out there would benefit from it and thus pat me on the back and think of me as a blogging superstar. Up until recently I've kept the comments here open and mostly un-moderated. Those days appear to be over. My apologies to those of you who respectfully leave comments (both Protestant and Roman Catholic). As is the case with most things, it takes only a few people to make a mess of an otherwise good thing. I don't sit glued to a computer monitor during the day, so if you leave a comment, it may take awhile for it to post. Yes, there was a "banned" list as part of this post, but most of the folks on it were anonymous. so it really didn't matter. I was banned from Catholic Answers 5 years ago to the day, for stating that one of Ratzinger's comments was sophistry. The moderator sent me a message telling me that my account would be locked if I don't agree to the rules, but considering I didn't do anything personal and didn't agree to what I was being accused of, he bans me. To the credit of some of the Catholics on the forum, they emailed me or used my blog combox to express their disappointment with CA. They agree that I got a raw deal. But, the reality is, I couldn't care less about CA. As a "ministry", especially the last couple years, it has become pabulum for the Catholic masses. Folks like Tim Staples and Jimmy Akin seem to be stuck in the same redundant apologetics and the novelty of Protestants turned Catholic apologists seems to be dying out. Listening to the former always sounds like a kindergarten teacher reading Green Eggs and Ham for the 100th time. It's painful. I posted several times to Catholic Answers using a Pen name "Attejohannes". Two years ago I got permanently banned for "contempt for catholicism"
I was charged with the "contempt" also, but not banned. A person on CA stated of one of my blog entries that I used the "same skill that O.J. Simpson attorneys rationalized away all the damning and obvious evidence." I stated, "This is truly offensive, and if it were up to me, you would be banned. I assume because I'm Protestant, no one will call you out on this, and will simply let you get away with it. This is yet another reason why I will never convert to your religion." I think it was the last line that got me in trouble. Churchmouse said... Folks like Tim Staples and Jimmy Akin seem to be stuck in the same redundant apologetics and the novelty of Protestants turned Catholic apologists seems to be dying out. There is a lot of repetition with Rome's defenders. For a religion that has development of doctrine, one would think the apologetics would develop as well. I was "suspended" from the CA Forums for a while and could go back, I suppose. But after seeing the treatment that James received while RC apologists would unload on him, I just never had the patience for it. Frankly, Catholics enjoy a much fairer hearing and open dialogue here and on other blogs that I frequent than do Protestants at CA. The moderators at CA apparently have it as their mission to provide a "protected environment" for Catholics. I believe that the level of apologetic suffers because of that kind of "hothouse" atmosphere. One thing I've learned from Catholic Answers is to save every post one writes, so if you do go back there, as soon as you post it, save it. They are not as bad as Madrid's Envoy Forums- it was actually quite humorous- one had to read or save Art Sippo's posts before the moderator got a hold of them to clean them up. We used to call her, "Patti scissor-hands." "The alert system at C.A. does not work for Protestants." -I can attest to that. I've given up the site for (an early) Lent. Not sure I'll bother going back. The resident anti-Lutheran there seems to have the mods in his back pocket. He can personally insult protestant posters, call protestant scholars liars, and deliberately and repeatedly misconstrue protestant writings without repercussions. It's just absurd. Yes, I'm not sure what's up with the CA mods in regard to Luther (and Lutheranism) bashing. It does appear as if there's a serious double standard going on on the "Non-Catholic Religions" forum. I just made a few comments on CA related to this, and I never know if I've crossed the point of no return. I'll also be putting up a blog post tomorrow on it. A few of the Lutherans on CAF are truly patient people. They have far more patience than I do. Looking forward to reading today's post. Hope you'll embed some of your responses in that thread - I don't want to gift CAF any more page views than necessary. I'm beginning to suspect that thread's 16,000+ views might be the reason certain posters their are permitted to sling their slander. I had never considered that page views may be a reason why the CA mods allow what they do, despite their stated rules. I guess it's possible. I simply assume that the CA mods hold very typical interpretations of Luther and the Reformation that coincide with the nonsense they allow to be posted. I will say there were some very good responses put up by Dr. Tait recently. I'm not exactly sure what harbor his theological ship is docked in, but it does go to show that one can be historically helpful without a clear theological label stamped on your forehead. 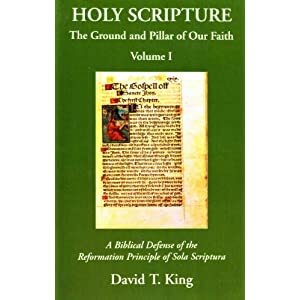 I've read some good materials on Luther from Lutherans, Reformed, and Roman Catholic. It is possible to be fair to history without violating one's theological integrity. The CAF folks don't appear to realize this.